The LOLA image below displays the local SW'erly windswell being kicked up by the trough of low pressure hanging over the region. BRIEF OVERVIEW: Jumbled mix of SW’erly swells through Sunday and much of next week; mainly local SW windswell with minor SW-SSW Southern Hemi groundswell. Unstable, stormy weather expected to prevail for the next several days. SWELL/SURF: Mixed-up blend of mostly local SW windswell and easing/minor SSW groundswell. Unorganized, sloppy surf mainly in the chest-head high range (4-5′) with occasional overhead waves/peaks (6’+). WEATHER/WIND: Stormy weather with breezy SW wind and rain showers/thunderstorms expected. SWELL/SURF: Mixed-up blend of mostly easing local SW windswell and minor SSW groundswell. Surf trying to organize a little better, but still jumbled. Surf is mainly in the waist-shoulder high range (3-4′) with occasional head high+ waves/peaks (5’+), biggest in the morning. WEATHER/WIND: Stormy weather with rain showers/thunderstorms expected. Wind may decrease some with light to moderate, variable southerly flow. SWELL/SURF: Mixed-up blend of mostly local SW windswell and minor SSW groundswell. Surf still jumbled, mainly in the waist-shoulder high range (3-4′) with occasional head high waves/peaks (5′). May see 5’+ windswell waves bump up before dark. WEATHER/WIND: Stormy weather with rain showers/thunderstorms expected. Light to moderate, variable southerly flow in the morning. Then breezy SW wind expected to rise up in the afternoon/night. SWELL/SURF: Mixed-up blend of increased local SW windswell and minor SSW-SW groundswell. Unorganized, sloppy head-overhead surf (5-7’+) with occasional well overhead waves/peaks (8’+), comprised mainly of the shorter period windswell energy. Stay posted, still pending development. WEATHER/WIND: Stormy weather with breezy WSW wind and rain showers/thunderstorms expected. 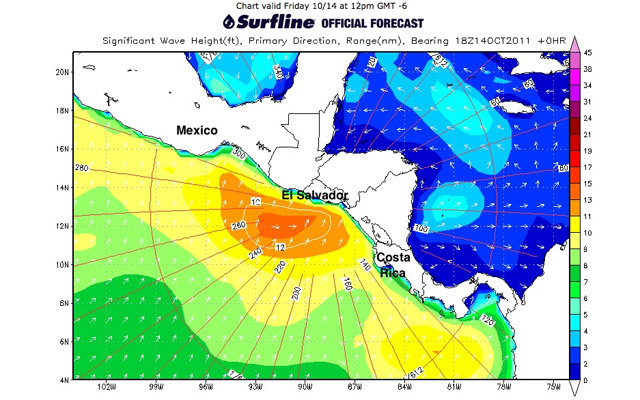 Note – WSW flow will be side-offshore for Punta Roca. 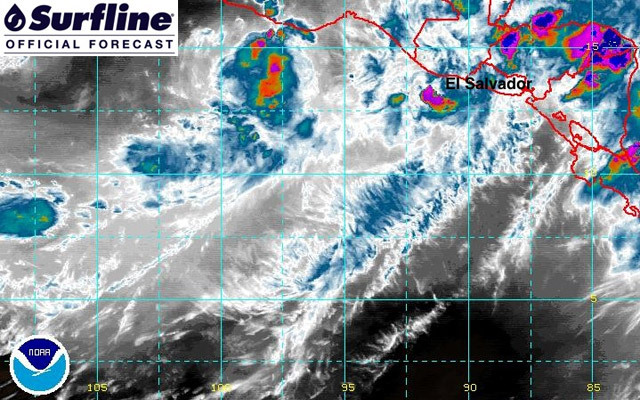 Tropical activity throughout the region has been vigorous lately, as a broad area of disturbed weather associated with a trough of low pressure covers the northern half of Central America into Southern Mexico (with El Salvador right in the middle of it). This trough has setup a substantial amount of breezy South to West wind offshore over the Pacific, directed at El Salvador and the surrounding countries. This fetch will maintain plenty of SW’erly windswell for Punta Roca on Sunday the 16th with mainly chest-head high surf. Occasional overhead waves will show during the better tides. The SW windswell may ease a notch for Mon/Tues (17th-18th) before rising back up once again for Wednesday the 18th with head-overhead+ waves. Stay posted for updates as the local windswell energy can fluctuate depending on the progress of the offshore tropical activity. Meanwhile, a fading southern hemi SSW groundswell (210-195 deg) will still provide waist-chest occasional shoulder-head high longer period sets Sunday morning, showing a little better as the tide drops some. Although this swell continues to fade going into next week, reinforcing small-scale and overlapping pulses of new southern hemi groundswells are due to arrive; SSW (205-185 deg) topping out Mon/Tues (17th-18th) and SW (225-205 deg) topping out Thursday (20th). Mon-Wed will hold fairly steady with 2-3’+ southern hemi sets at Punta Roca. Thursday will see the longer period SW sets bump up to 3-4’+. Keep in mind that these southern hemis will mix in under the local and more dominant SW windswell that will be running. T SW groundswell will then ease through the rest of the week. Beyond that; we’ll be watching for the possibility of a new and strong storm/swell development through the next few days over the central-eastern South Pacific. At this time, we may see a gradual build of SW-SSW groundswell (215-190 deg) over the weekend of the 22nd-23rd, peaking on Monday the 24th with potentially solid surf. Stay tuned, still pending development. WIND/WEATHER CONDITIONS: October is typically the worst month for weather/wind conditions throughout Central America, with heavy rainfall scattered throughout and onshore winds prevailing regularly. Currently, a broad area of disturbed weather stretches offshore and over El Salvador with potential for further development into an organized system. As a result, scattered showers and thunderstorms are expected to continue for the next several days throughout the region. At this point; Sunday the 16th and Tuesday afternoon through Wednesday the 18th-19th are expected to see breezy side-onshore flow from the SW for Punta Roca. Monday the 17th and Tuesday morning may have pockets of fair conditions, while Thursday the 20th could see a clean up with light northerly wind. Keep in mind that the weather/wind in the region is very dynamic and capable of changing quickly and drastically. NOTE – Passing showers and thunderstorms will be capable of affecting/switching local wind conditions around. Keep in mind that heavy rainfall will affect road conditions.